For the MTV television film, see Turn the Beat Around (film). "Baby Now That I Found You"
(1975) "Turn the Beat Around"
(1976) "Never Gonna Let You Go"
"Turn the Beat Around" is a disco song written by Gerald Jackson and Peter Jackson and performed by Vicki Sue Robinson in 1976 (see 1976 in music), originally appearing on her debut album, Never Gonna Let You Go. Released as a single, the song went to #10 on the Billboard pop charts, and #73 on the soul chart. Robinson received a grammy nomination for best female pop vocal. The track went to number one on the disco chart for four weeks. "Turn the Beat Around" is considered a disco classic and is featured on many compilation albums. "Turn the Beat Around" was written by brothers Gerald and Peter Jackson of the R&B outfit Touch of Class. Peter Jackson knew Al Garrison, an engineer at Associated Studios in New York, via his [i.e. Peter Jackson's] work as a session drummer, and it was at Associated Studios that Touch of Class cut its own demos. Peter Jackson recalls that one Sunday at noontime "I called Al and said...we want to come in and [cut a] demo...He was leaving at four...He said: 'My girl[friend]’s coming to pick me up for dinner. You have to be done [by then]." Garrison's girlfriend turned out to be singer Vicki Sue Robinson whose debut album was nearing completion requiring one additional track. On arriving at Associated Studios that Sunday, Robinson overheard the playback of the "Turn the Beat Around" demo which Touch of Class had just recorded and according to Peter Jackson said: "Oh, man, I’ve gotta have that song." Gerald and Peter Jackson initially demurred, wishing to submit "Turn the Beat Around" along with four earlier demos to be green-lighted for the Touch of Class debut album. Peter Jackson - "Monday [the next day], Gerald and I go up to Midland [Touch of Class' label]. We’re excited because we know this song ["Turn the Beat Around"] is slammin’...[Midland] took the other four songs and they passed on that one. They said: 'We don’t like that one. The lyrics move too fast. You have that jungle beat in there. It’s not what’s happening'." Peter Jackson resultantly called Vicki Sue Robinson to give her the song for her album. When Jackson told Robinson: "'I’ll meet you down on Thirty-Fourth Street [with the demo]' she said: 'I [already] made Al give me a copy.'" 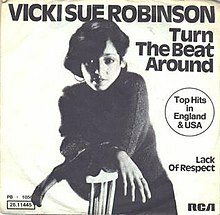 Robinson recorded "Turn the Beat Around" on September 26, 1975, cutting her lead vocal in a single take after recording her own multi-tracked chorale vocals. Like the other cuts on Robinson's debut album Never Gonna Let You Go, "Turn the Beat Around" was recorded at RCA Studios with producer Warren Schatz who recalls the basic master of the song was recorded "on a Friday after a very depressing week of rain [and] I hated [the track]! I listened to it in my office and I just couldn't get it. It had been such a bad week that I just couldn't hear anything with an open mind. Then David Todd, the head of disco promotion at RCA, came into my office and he went crazy over the track! He convinced me to finish it as soon as possible." Issued as a single in February 1976 "Turn the Beat Around" became a club smash subsequently breaking on Top 40 radio in Boston - where it would reach #1 that June - to make a gradual ascent on the national Pop chart: the Billboard Hot 100 to reach a #10 peak in August 1976. "Never in a Million Years"
(1990) "Turn the Beat Around"
(1990) "Didn't We Almost Win It All"
Laura Branigan covered the song in 1990, becoming the first major artist to do so. It was released as the third and final single from her self-titled sixth studio album, however only to radio and clubs. The song was co-produced by Branigan and Steve Lindsey for the album, with several remix versions following garnering significant play in Hi-NRG clubs. 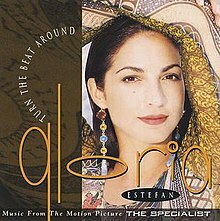 (1994) "Turn the Beat Around"
(1994) "Hold Me, Thrill Me, Kiss Me"
In 1994 (see 1994 in music), the song was recorded by Gloria Estefan for the soundtrack to the film The Specialist. Released as a single, it became a hit reaching #13 on the Billboard Hot 100 and is also featured on Estefan's fourth solo album Hold Me, Thrill Me, Kiss Me. She also sang the song as her opening performance in VH1's first ever Divas Live. She also took the song to the top spot on Billboard's Hot Dance Club Play chart, making it her first number-one song on that chart in English. Music & Media wrote about the song: "Estefan revives her Miami Sound Machine days of fatback disco by covering an old Vicky Sue Robinson song." Network 40 wrote: "A classic remake of the 1976 Top 10 gem by Vicki Sue Robinson. Uptempo flavor spiced with trademark Miami Sound Machine overtones, this number is a multi-format hit." The chorus is used in the lead out of the 1982 Soft Cell song "Memorabilia". Lil Suzy covered the song for her 1993 album Back to Dance. It was released as the lead single. Cobra Starship covered the song for the MTV movie of the same name. A television advertisement for "I Can't Believe It's Not Butter" featuring Megan Mullally contains the parody "Turn the Tub Around"
In the second Star Wars Family Guy episode, the song is parodied as "Turn the Ship Around". In 2003, the song is used in Mitsubishi Kuda Grandia advertisement in Indonesia along with the three Bon Jovi songs: It's My Life, Always and Everyday. The 2005 song "Perfection" by Dannii Minogue and the Soul Seekerz samples "Turn the Beat Around". This song was covered many times on American Idol. Both Carmen Rasmusen and Diana DeGarmo performed this song at the Top 6 of American Idol Season 2 and Season 3, respectively. Haley Scarnato also covered this on the sixth season of American Idol. Jessica Sanchez performed the song on the Top 12 of American Idol Season 11. This song is featured on the 2012 movie Pitch Perfect, as part of the performance by the group Barden Bellas. The song appeared in the 2015 movie The Martian directed by Ridley Scott and starring Matt Damon. The song is featured in the 2016 Netflix series "The Get Down" created by Baz Luhrmann. ^ a b Whitburn, Joel (2004). Top R&B/Hip-Hop Singles: 1942-2004. Record Research. p. 497. ^ Whitburn, Joel (2004). Hot Dance/Disco: 1974-2003. Record Research. p. 219. ^ Arena, James (2014). First Legends of Disco. Bloomington IN: Author House. p. 274. ISBN 978-1-4918-4828-9. ^ "Forum - 1970 (ARIA Charts: Special Occasion Charts)". Australian-charts.com. Archived from the original on 2016-06-02. Retrieved 2016-12-04. ^ "Cash Box Top 100 8/21/76". ^ "Top Singles – Volume 26, No. 14 & 15, January 08 1977". RPM. Library and Archives Canada. Archived from the original on June 10, 2016. Retrieved December 15, 2016. ^ "Top 100 Hits of 1976/Top 100 Songs of 1976". ^ "Cash Box YE Pop Singles - 1976". ^ "Laura Branigan - Turn the Beat Around (Vinyl, 12") at Discogs". Discogs. Retrieved December 13, 2013. ^ "New Releases: Singles" (PDF). Music & Media (1994-02-12, page 12). Retrieved 2018-02-26. ^ "Mainstream: Music Meeting" (PDF). Network 40 (1994-09-09, page 20). Retrieved 2018-02-21. ^ "australian-charts.com > Gloria Estefan discography". Hung Medien. Retrieved 2015-09-20. ^ "RPM (Nov 21, 1994)". RPM. Retrieved 2018-03-09. ^ "RPM Dance (Dec 05, 1994)". RPM. Retrieved 2018-03-08. ^ "Eurochart Hot 100" (PDF). Music & Media. Retrieved 2018-03-15. ^ "Nederlandse Top 40 – Gloria Estefan" (in Dutch). Dutch Top 40. ^ "Dutchcharts.nl – Gloria Estefan – Turn the Beat Around" (in Dutch). Single Top 100. ^ "Official UK Dance Singles Chart (09 October 1994-15 October 1994)". officialcharts.com. Retrieved 2018-02-09. ^ "Cash Box Top 100 Pop Singles" (PDF). Cash Box (1994-11-26). Retrieved 19 February 2018. ^ "Billboard Top 100 - 1995". Longboredsurfer.com. Archived from the original on 2009-08-15. Retrieved 2010-08-27. ^ "Memorabilia Lyrics - Soft Cell". Sing365.com. Retrieved 2016-10-11. ^ Erika Brooks Adickman (2010-02-01). "Turn The Tub Around: I Can't Believe It's A Commercial". Idolator. Retrieved 2016-10-11. "It's Been Hard Enough Getting Over You"
"How Can I Help You to Say Goodbye"
"Looking Out for Number One"
This page was last edited on 22 April 2019, at 10:17 (UTC).